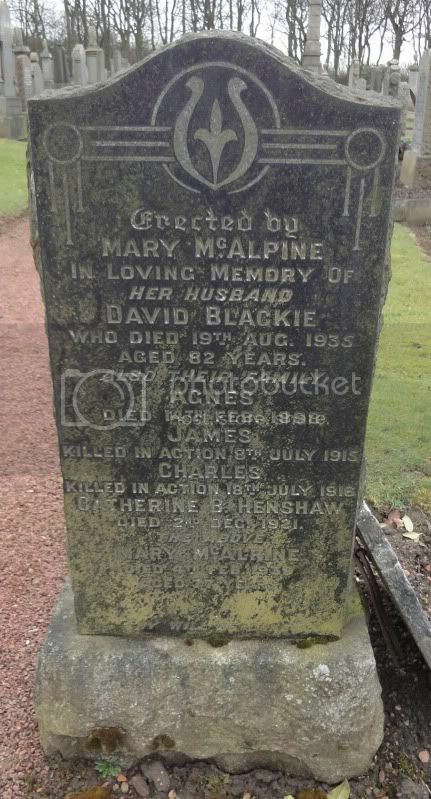 Additional information: Son of Archibald McLean Shaw and Anna McLean Shaw, of Chapelhall. Grave/Memorial Reference: Sec. D. Grave 36. 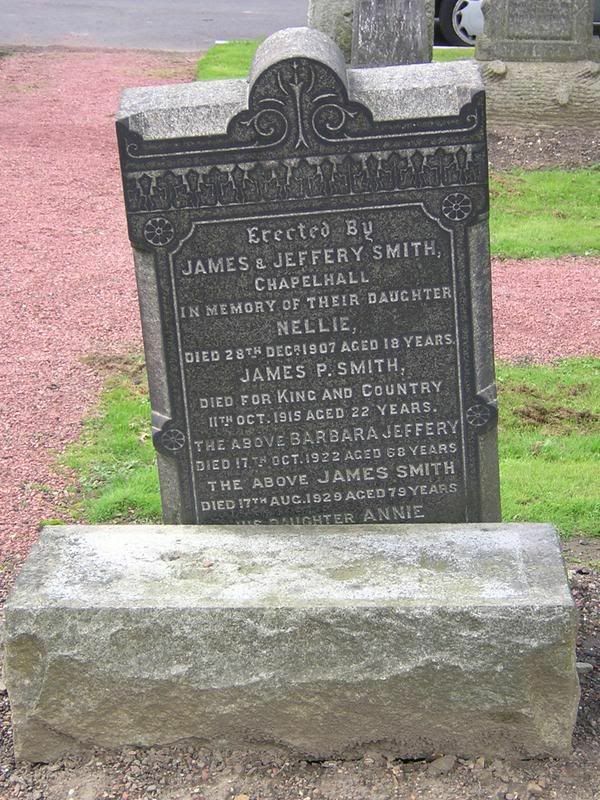 Additional information: Son of James and Barbara Jeffery Smith, of Ashmore, Chapelhall, Airdrie, Lanarkshire. 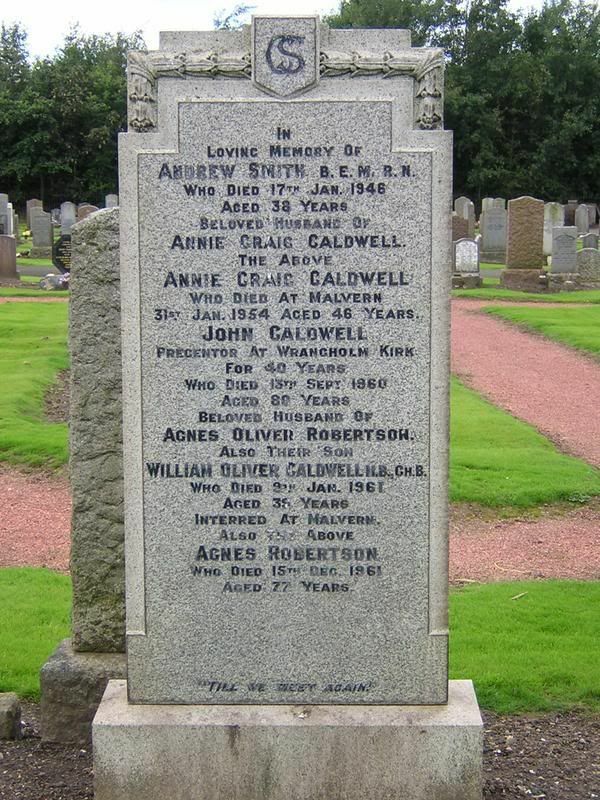 Additional information: Son of Andrew and Sarah Hope Smith; husband of Annie Craig Smith, of Motherwell. Grave/Memorial Reference: Sec. G. Grave 60-61. 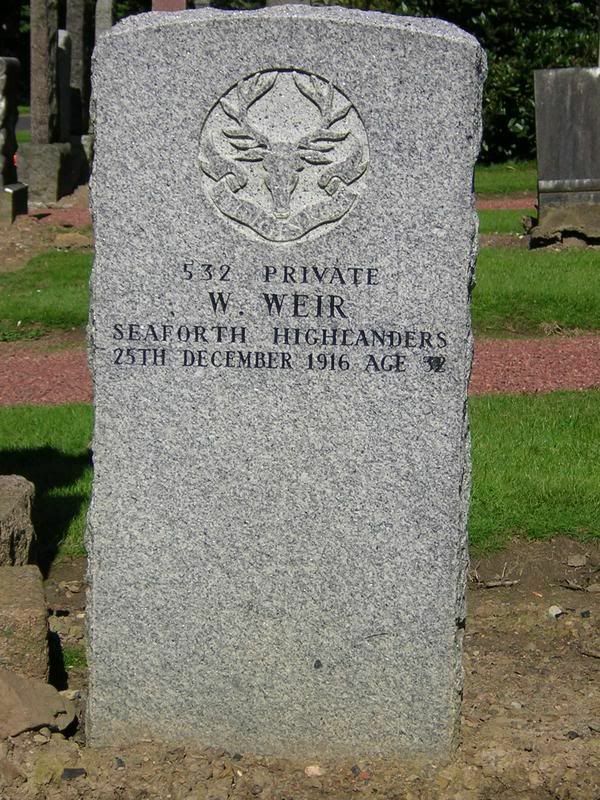 Additional information: Son of James and Jeanie Weir, of Hazelbank Terrace, Bellshill, Lanarkshire. Born at Larkhall, Lanarkshire. 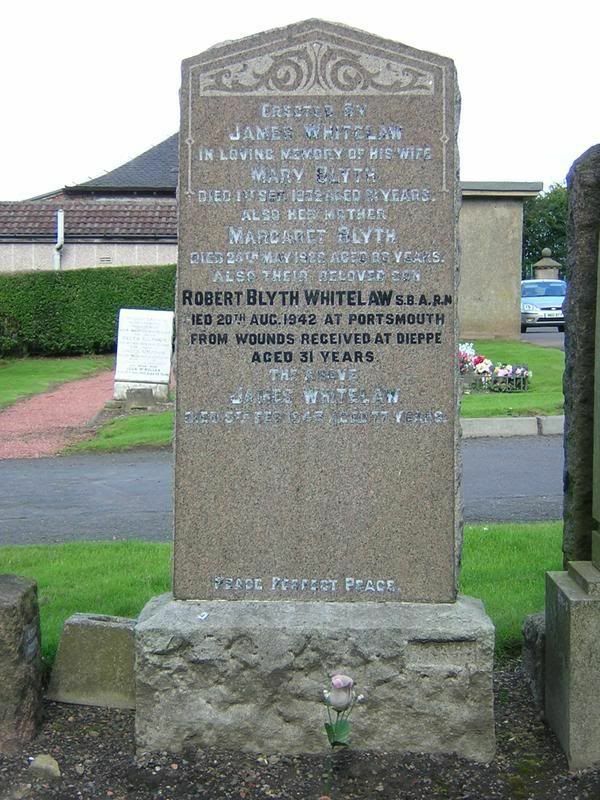 Additional information: Son of James Whitelaw and of Mary Whitelaw (nee Blyth), of New Stevenston. Grave/Memorial Reference: Sec. B. Grave 1147. Unit Text: 235 Searchlight Regt. 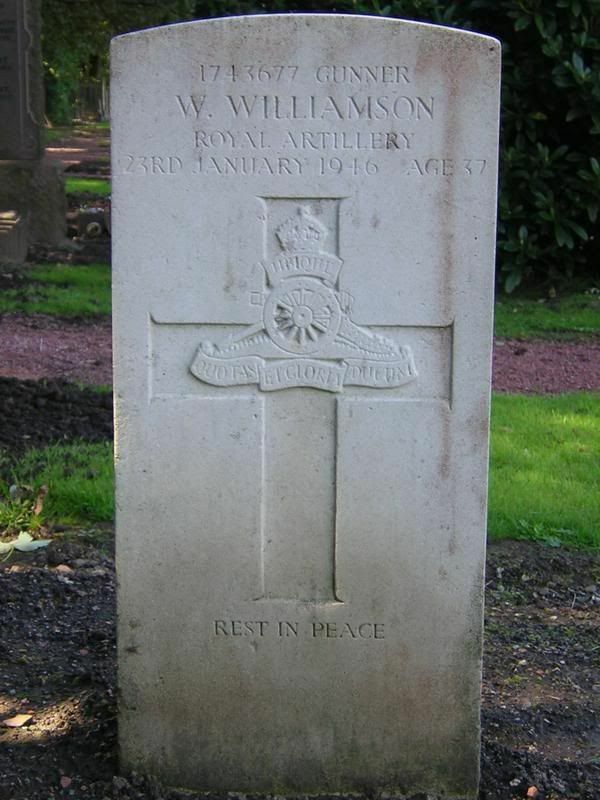 Additional information: Son of William and Mary Ann Morris Williamson; husband of Adela Williamson, of Glasgow. Grave/Memorial Reference: Sec. B. Grave 833. Additional information: Son of Mrs. Agnes Andrews, of 62, Main St., Chapelhall, Airdrie. Grave/Memorial Reference: L. E. 20. Unit Text: "C" Coy. 16th Bn. 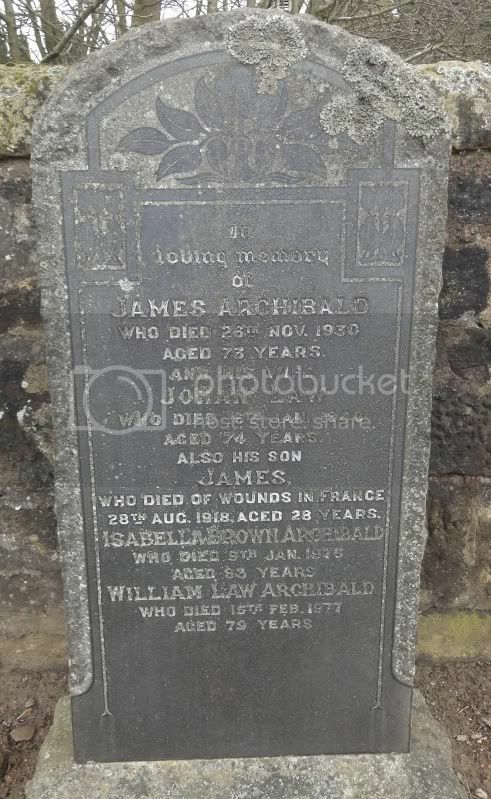 Additional information: Son of James and Johan Archibald, of Limefield Mains, West Calder, Midlothian. M.A. Edinburgh University. Grave/Memorial Reference: VIII. A. 38. Unit Text: "A" Coy. 7th Bn. Additional information: Son of the late William and Margaret Barclay. 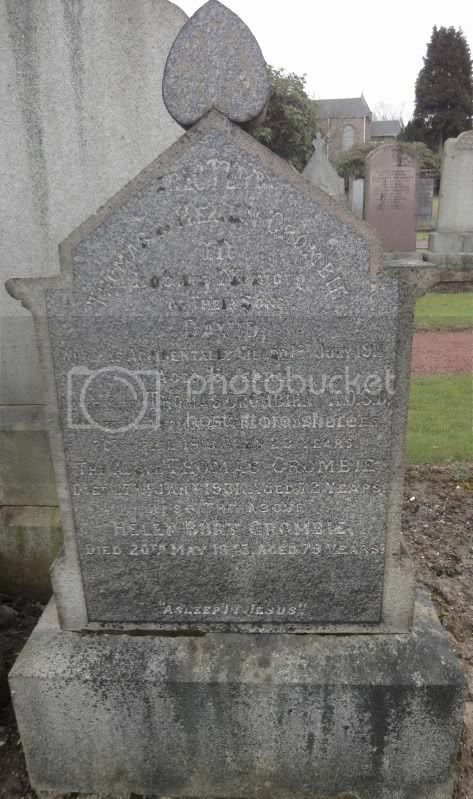 Additional information: Son of David and Mary Blackie, of 20, Mosshall St., Newarthill, Motherwell, Lanarkshire. Grave/Memorial Reference: VI. L. 11. 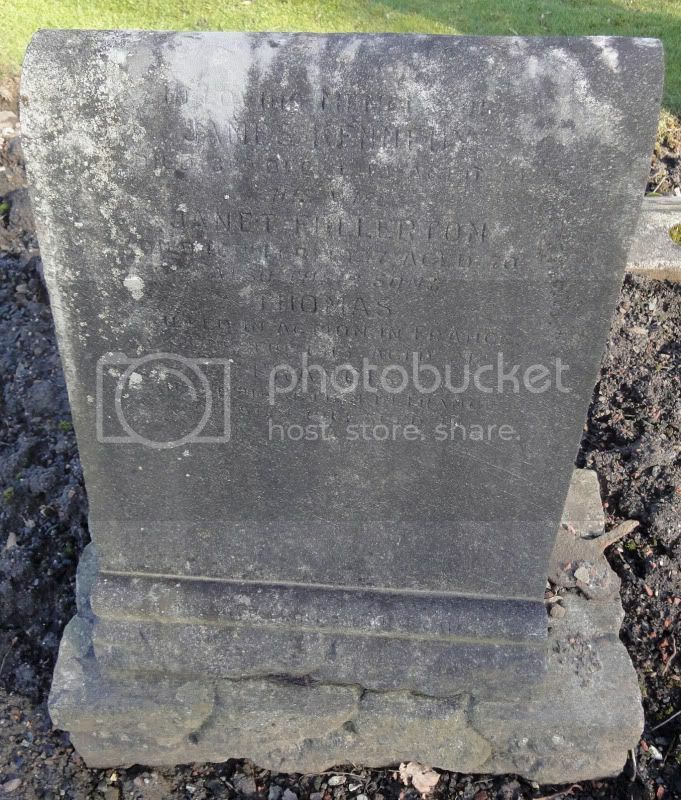 Additional information: Son of James Mitchell Buchanan and Martha Young Buchanan; husband of Dora Bruntin Buchanan, of Clarkston, Lanarkshire. Grave/Memorial Reference: Panel 1, Column 2. 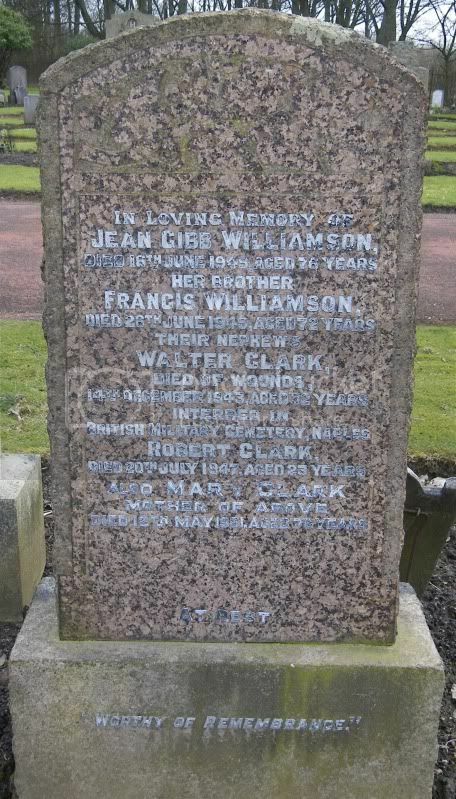 Additional information: Son of Mary Clark, of Newarthill. Lanarkshire. Grave/Memorial Reference: III. G. 18. Grave/Memorial Reference: XI. C. 8. Additional information: Son of James and Annie Gardner. Grave/Memorial Reference: I. J. 6. Unit Text: "A" Bty. 86th Bde. Additional information: Son of John and Mary Gardner, of Gray's Buildings, Stevenston St., New Stevenston, Holytown, Lanarkshire. Grave/Memorial Reference: XVII. C. 1. Unit Text: 209 Field Coy. 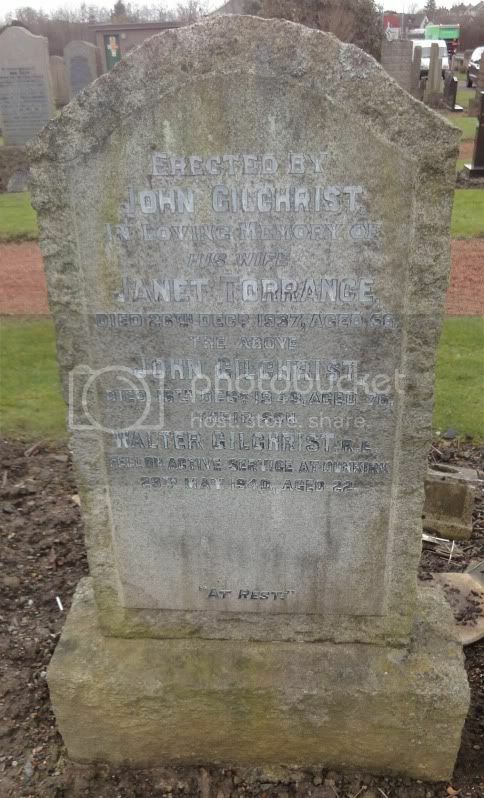 Additional information: Son of Mr. and Mrs. John Gilchrist, of Holytown, Lanarkshire. Grave/Memorial Reference: IX. B. 12. Unit Text: 15th Bty. 36th Bde. 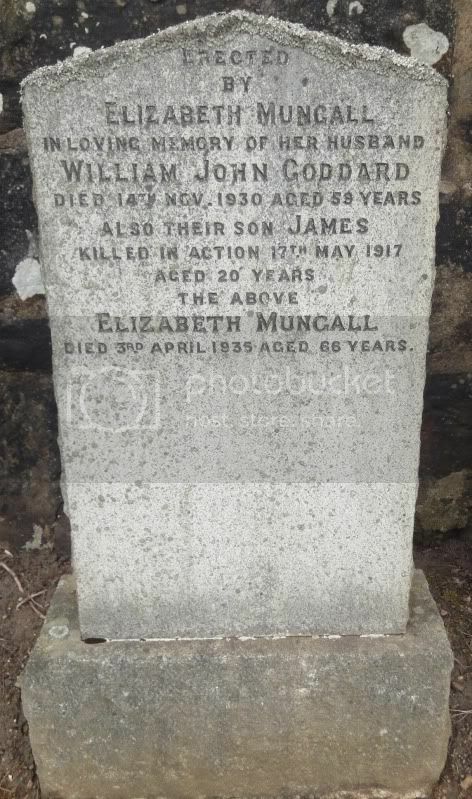 Additional information: Son of William and Elizabeth Goddard, of Police Station, Braehead, Carnwath, Lanarkshire. Native of Blantyre, Lanarkshire. Grave/Memorial Reference: XVIII. O. 8. 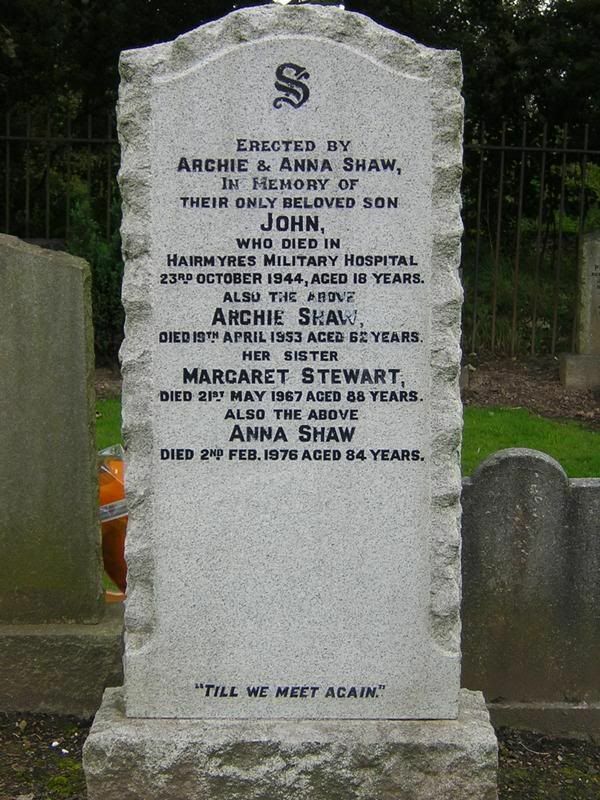 Additional information: Brother of John Greenshields, of 65, Main St., Holytown, Lanarkshire, Scotland. Additional information: (Served as GRAHAM). 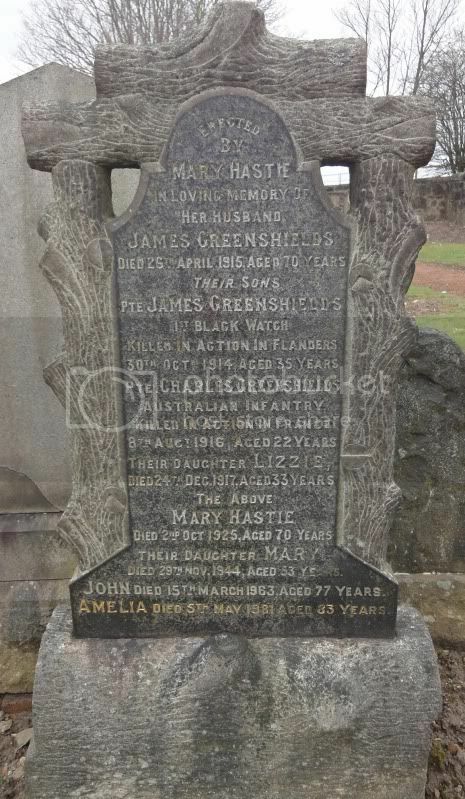 Son of Mary Hastie Greenshields, of 65 Main St, Holytown,Lanarkshire, and the late James Greenshields. Additional information: of 17 Whittagreen Avenue, Newarthill, Motherwell, Lanarkshire. Daughter of Mrs. Ferguson, of 14 Fraser Street, Cleland, Lanarkshire, and of the late George Ferguson; wife of the Revd. George Greig. Additional information: of 17 Whittagreen Avenue, Newarthill, Motherwell, Lanarkshire. 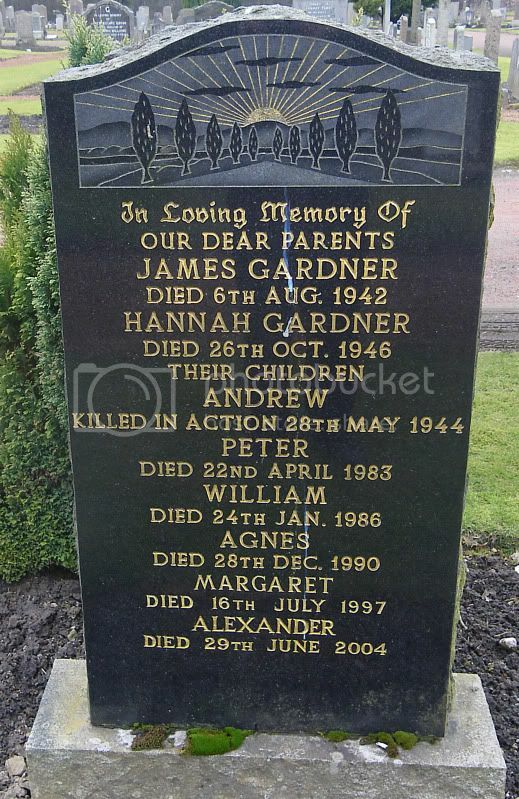 Son of Marion Greig, of the same address, and of the late James Greig; husband of Elizabeth Pettigrew Pennycuik Greig. 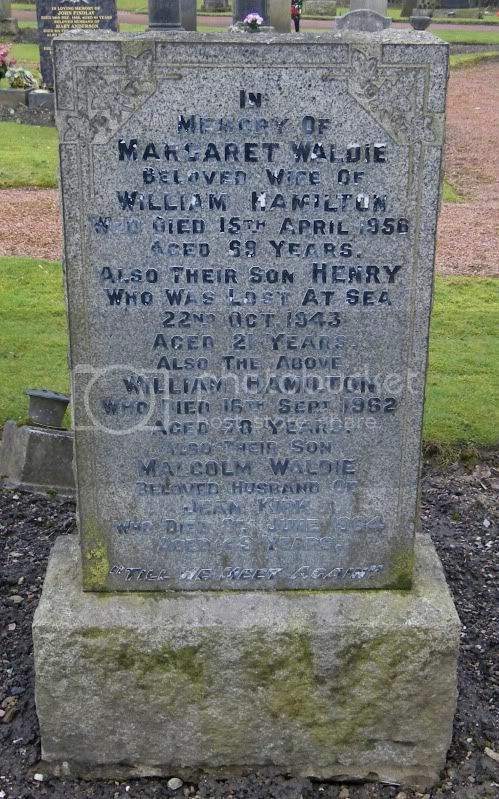 Additional information: Son of William and Margaret S. W. Hamilton, of Newarthill, Lanarkshire. Grave/Memorial Reference: Panel 77, Column 2. Grave/Memorial Reference: III. O. 20. Additional information: Son of Mr. and Mrs. Richard Jones, and stepson of Mrs. C. Jones of Mossend, Bellshill, Lanarkshire. Grave/Memorial Reference: Bompai Sec. Grave 104. Grave/Memorial Reference: Panel 108 to 112. Place of birth Ayr Other 11th Bn. This MAY be Francis Kennedy - the birthplace of Ayr 'fits'!